The only time I could squeeze in a workout the other day was at 6am in my hotel room. I had no equipment and couldn’t make any noise in consideration of my sleeping baby and the guests staying below me. So, I came up with a HIIT (High Intensity Interval Training) workout that requires 0 jumping. This is also great for mamas who aren’t ready to start jumping. Though, I wouldn’t recommend this workout until you’ve regained some strength, at least at 3-6 months postpartum. Check with your doctor before starting any exercise program. 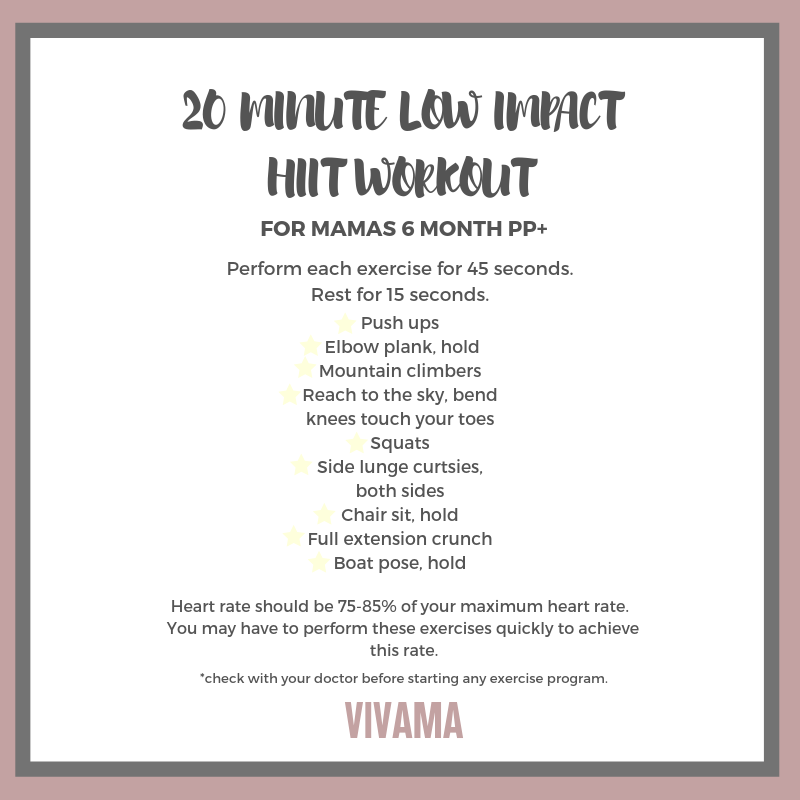 HIIT has many benefits and is great for mamas because you can get in a heart pumping workout from almost anywhere. The important thing to keep in mind when you are doing a HIIT workout is that it is important that your heart rate hits around 75-85% of your maximum heart rate in order to be effective. You can measure your heart rate by counting the pulse on your neck for 10 seconds and multiplying by 6. I usually do this during the rest periods. Here is a simple heart rate calculator that will help you find your target heart rate.